'Magnus' has been one of the smartest comics this year and the conclusion to this mini is an example of its subtle greatness. Eschewing violence and spectacle, Kyle Higgins uses a more thoughtful diplomatic approach that rings true for the de-escalation of all-out war between man and machine. With Frederick seemingly dead from his own hand and bombs still set to blow, Magnus races against time to find them and find peace between AI robots and human protestors outside of The Looking Glass in the process. She makes one last-ditch effort to appeal to one of the factions, find the bombs, and more importantly ask for more time to solve the complicated relationship between oppressed sentient robots and their cruel masters. It's heady stuff for science fiction but one that feels perfectly suited for the genre. Meanwhile, Looking Glass has plans of their own. Higgins is more interested in avoiding disaster than using it as motivation for the next chapter. He respects the character of Magnus too much to allow her to devolve into an agent of brute force without exploring every ounce of diplomacy and negotiation. She has to walk a fine line between her humanity and the empathy she feels for robot-kind. There's too much at stake for both to allow it all to literally blow up. Her decisions change the course of the story and open up a whole new world of possibilities that I hope Higgins gets to tell in the future. The impact of 'Magnus' wouldn't be complete without the stellar art from Jorge Fornes and Chris O'Halloran. 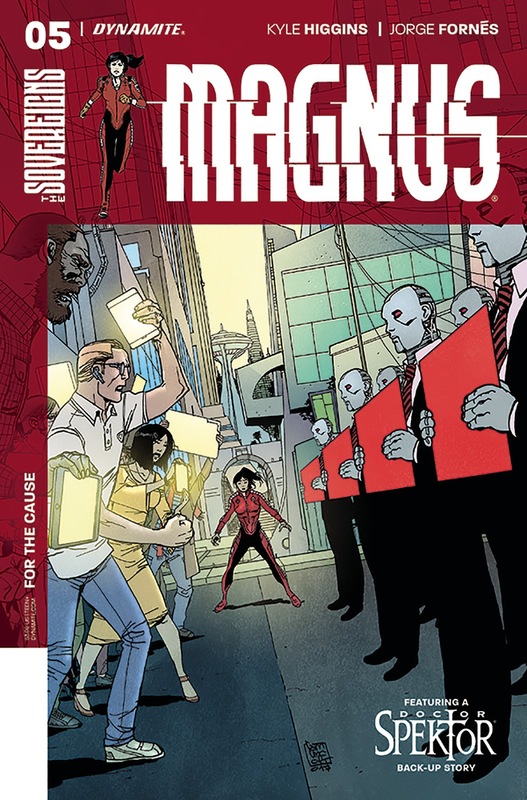 Just as incredible and defining as David Aja's Eisner Award-winning work on Marvel's 'Hawkeye' was Fornes has done the same level of distinguished work on 'Magnus.' His amazing designs especially those of the robots adds credibility to the story, making it all the more realistic that such a future is possible. The layouts are as effective for what he includes in a panel as what he excludes. Using silhouettes and shadows and various angles, Fornes keeps us glued to the page to see what happens next. Sometimes heartbreaking, sometimes desperate, 'Magnus' reverberates with intensity from the dense use of words and perfectly expressed close-ups. Chris O'Halloran's limited color palette provides a distinctive landscape of warm blues, purples, reds, and yellows. 'Magnus' is destined to be a classic sci-fi comic that reinvented the Robot Fighter of yore. Higgins, Fornes, and O'Halloran have created something special. This is a smart thriller with societal allegories galore and the execution is so good it'll resonate long after you've put it down. The greatest compliment I can offer is I want more and I want more now.